The unofficial motto of Tatarstan is: “Bez Buldırabı!,” which translates to “we can.” Tatarstan is one of Russia’s most developed republics and its multiethnic, multilingual and multi-religious identity has all helped it shape its image as a put together, can-do people. While most visitors to the Republic flock to Kazan, there are numerous smaller cities that dot its landscape, where famed artists and poets have flocked from other parts of Russia during times of war and confusion and where some of the most iconic Soviet brands are still produced. Bugulma straddles the border of Orenburg Region in the southern reaches of the Republic. While pop singer Alsou, who finished in second place in the Eurovision pop contest in 2000, was born here in 1983, one of the town’s more unusual visitors was Jaroslav Hašek, the Czech writer famous for his satiric novel, “The Good Soldier Švejk.” He spent three months here as a medic during the Russian Civil War in 1918 and is memorialized with a museum. Another person that spent a spell in Bugulma was the actor Aleksey Batalov, most famous as the male lead in the films, “The Cranes are Flying” (1957) and “Moscow Does Not Believe in Tears” (1979). He was evacuated here during the war with his mother Nina Olshevskaya, a former student of Stanislavsky’s, and got his start here with the local theater. The theater was named in his honor in 2008 and excursions are available. 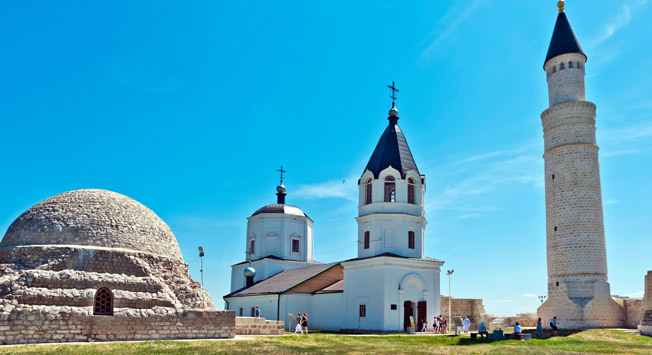 Located south of Kazan along the Volga River is a settlement near the town of Bolgar that was the on-again off-again capital of the Volga Bulgars between the 7th-15th centuries. Just declared a UNESCO World Heritage Site in 2014, a small ancient town has been preserved, featuring an old mosque that symbolizes the acceptance of Islam by the Volga Bulgars in 922 A.D. Today this is a popular destination for Muslim pilgrims in Tatarstan. During World War II Chistopol became a safe haven for members of the Union of Soviet Writers. Authors such as Boris Pasternak, Anna Akhmatova Leonid Leonov, among others, lived and worked here for several years. Pasternak at least got a museum. The town is also notable for being home to the watch factory of Vostok, which was founded in 1941 (examples of their products can be seen here). It is one of the few plants in the world where watches are still made from start to finish. The city also features one of the oldest surviving wooden mosques in Russia. Anatoly Marchenko, one of the Soviet Union's most prominent dissidents died in Chistopol at the prison hospital at age 48, after a three-month-long hunger strike. His death was influential in convincing Mikhail Gorbachev to release political prisoners on a mass scale in 1987. He is buried at the Novoe Russkoe kladbishche. This city’s identity is most wrapped up with the Kamaz truck factory, which has produced vehicles that have won the Dakar Rally a record twelve times. There is a special exhibition dedicated to the trucks at the city history museum. The internationally-known pagan metal band Alkonost is from here and often hosts concerts locally. Naberezhnye Chelny is also one of the premiere places to celebrate Sabantuy, a Bashkir, Tatar and Idel-Uralian summer festival (usually celebrated in late June) dating from the times of the Volga Bulgars. Additional highlights include an enormous and original statue dedicated to Russian bard Vladimir Vysotsky and a dolphinarium. Nizhnekamsk, the third largest city in the Republic, is the least obvious place to visit on this list. It is one of Russia’s largest petrochemical centers, but does feature a KHL hockey team, HC Neftekhimik, that plays in Russia’s highest division. The city also takes a certain pride in being the sixth city in Russia outside of the Moscow Region to get a McDonald’s. Yelabuga is considered one of the more picturesque of Tatarstan’s cities. It was the birthplace of Ivan Shishkin, a famous landscape painter associated with the “peredvizhniki” (wanderers or itinerant) movement in the late 1800s. A museum is dedicated to him. The poetess Marina Tsvetaeva, considered one of the greats of Russian literature in the 20th century, committed suicide by hanging here in 1941 and is buried in the municipal cemetery. She had been evacuated here because of the war and also has a museum complex in town. Additionally, Nadezhda Durova, who dressed like a man in order to become the first known female military officer in Russia during the Napoleonic Wars, lived in Yelabuga between the years 1831 and 1866. She has been celebrated by a film (Eldar Ryazanov’s “Hussar Ballad”), a play and an opera. Her memoirs, “The Calvary Maiden,” have been translated into English, and was one of the first autobiographies to appear in the Russian language. Unsurprisingly, Durova also has a museum.